Cats usually become infected with Bartonella through exposure to fleas. While you may not be familiar with Bartonella, you’ve probably heard of cat scratch disease, a human condition caused by one form of this bacteria. As the name suggests, people can get this disease from the scratch or bite of an infected cat. But dogs and cats can get sick from these bacteria as well, often from exposure to infected fleas. Although many animals can carry different forms of the bacteria, including dogs, wild canines, cattle and pocket pets, cats appear to be the main source for human infections with Bartonella henselae, the cause of cat scratch disease (or cat scratch fever). While people usually become infected from the bite or scratch of an infected cat, they may also become infected when the cat licks an open wound. Symptoms in humansmay include a fever and enlarged lymph nodes, but young children or immunocompromised people may experience more severe complications. 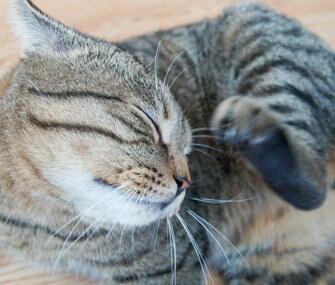 Exposure to infected flea dirt, or droppings, from the cat flea (Ctenocephalides felis) is believed to be the main way cats are infected withBartonella. Cats do not appear to become infected through cat bites, scratches, grooming, sharing litter boxes or food dishes. Dogs may acquire Bartonella though contact with fleas or a cat bite or scratch. The bacteria survive by living in red blood cells and the cells lining internal organs. In this way, the bacteria can hide from the body’s natural immune system and antibiotics directed against them. The bacteria can also infect other types of cells, such as those in the central nervous system and bone marrow as well as in certain types of white blood cells. The signs of infection can vary depending on the different species of bacteria. While most cats show no signs of infection, some may have a transient fever, lethargy and decreased appetite. If a cat is positive for feline immunodeficiency virus (FIV) and is also infected with Bartonella, he may experience inflamed gums and enlarged lymph nodes. Clinical signs associated with bartonellosis in dogs can include fever, weight loss, decreased appetite, lethargy, coughing, intermittent joint pain and lameness, weakness, skin lesions, enlarged lymph nodes and potentially jaundice (yellowing of the skin). Infected cats may show transient signs or no signs at all, and routine blood work may not reveal any hints to the infection. But when dogs or cats become ill, your veterinarian may recommend special blood tests for Bartonella. Pets that test positive for the infection are generally treated with a four- to six-week course of antibiotics. Minimizing your pet’s exposure to fleas is the most important means of reducing transmission of Bartonella as well as other disease-causing organisms carried by these pests. Your veterinarian can recommend an effective product that’s right for your cat or dog. Is My Pet Drinking Enough Water?